In this pAsuram, mAmunigaL is following AzhwAr’s pAsurams of determining the goal and is mercifully explaining it. How is that done? While AzhwAr was explaining emperumAn to be mOksha pradhan (one who grants liberation), he was also greatly glorifying mOksham in the beginning, middle and the end [of the decad], ISvaran thought “It seems AzhwAr is desirous of mOksham”, and decides to grant him that; AzhwAr rejected it considering “mOksham given to me for my pleasure is filled with ahankAram (self-interest, ego) and hence it is apurushArtham (not the result)”; AzhwAr subsequently says “Let me live in paramapadham joyfully or in material realm with grief, I have no relationship with that; you mercifully make me exist in that particular state which is pleasing to you” and determines the goal in thiruvAimozhi 2.9 “emmA vIttu“; mAmunigaL mercifully explains this starting with “emmA vIdum vENdA“. Oh heart! Placing the divine lotus feet of AzhwAr who is the cause for our sustenance, who mercifully spoke saying “Oh lord! It is sufficient to have the divine feet of your highness”, on our head, without any desire for lowly results, you shall rise more and more. emmA vIdum vENdA enRankkun thALiNaiyE ammA amaiyum ena Ayndhuraiththa – I don’t need mOksham which is distinguished in any manner; mercifully spoken by AzhwAr who determined to have emperumAn‘s divine feet on his head, after analysing liberation in the context of nature of jIvAthmA (self, SEshabhUtha, the servitor) and paramAthmA (SEshi, the lord), saying “the divine feet of your highness are sufficient” as said in SrI rAmAyaNam ayOdhyA kANdam 98.8 “yAvanna charaNau – SirasA dhArayishyAmi” ((I will not be at peace until I hold the divine feet of SrI rAma on my head). Instead of Ayndhu, it can also be seen as vAyndhu, meaning “being fixed in this principle”. This is following AzhwAr’s “emmA vIdu” from the beginning. AzhwAr started with “nin semmA pAdha paRputh thalai sErththu” (joining your great divine lotus feet on my head) [1st pAsuram] and ended it with “un ponnadi sErththu” (uniting with your golden feet) [10th pAsuram]. thALiNaiyE indicates what is said by AzhwAr in “thanakkEyAga enaik koLLum IdhE” (he should have me for his own sake only) [4th pAsuram]; having the head to be the seat for emperumAn’s divine feet, is total subservience. 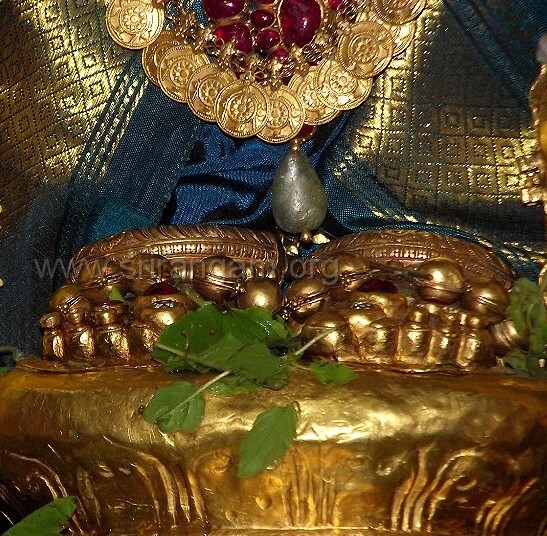 nammudaiya vAzh mudhalA mARan – AzhwAr, who is the cause for the wealth which matches our nature. AzhwAr’s sustenance is based on ISvaran as said in “thaniyEn vAzhmudhalE” (primary cause for living to me who is lonely); mAmunigaL‘s sustenance is based on AzhwAr. malarth thALiNai sUdi – Wearing flower like divine feet of AzhwAr just as those who wear fresh flowers as said in thiruvAimozhi 4.3.6 “kOlamAm en sennikku un kamalam anna kurai kazhalE” (your infinitely enjoyable lotus flower like divine feet which make sounds of bravery are the shining radiant decoration for my head) and in “pAdha paRputh thalai sErththu” (joining your lotus feet with my head) [1st pAsuram]. kIzhmai aRRu nenjE kiLar – Oh heart! Eliminating the lowliness of worshipping others, without getting bewildered, rise more and more, on sustaining yourself after worshipping AzhwAr. This entry was posted in Other, thiruvAimozhi nURRandhAdhi on December 16, 2018 by Sarathy Thothathri.